What’s your role at CPW Dentistry? I am a Dental Assistant, and I have 15 years of experience. I’m also part of the Invisalign Concierge team. A typical day for me starts by preparing the ops and sterilization areas for the day. I assist both the doctors and hygienists on different days; however, I make myself available for whoever needs help, including the front desk. Some of my duties include taking x-rays, breaking down the rooms, sterilizing instruments, checking to make sure all the cases scheduled to be delivered are present in the office, and stocking supplies as needed throughout the day. I’m also usually the go-to girl for anything iTero scanner related. When a patient gets a scan done for Invisalign, I’ll go over their simulation with them so they can see their current bite vs. what it will look like after treatment. A big part of my job is also to comfort people who are nervous by holding their hands and just making sure they feel comfortable. Getting to work with different doctors as well working with a large group of team members. At my previous offices I was the only assistant, so at times it could be a little lonely and very stressful. At CPW there is always someone available to help if you need it. I appreciate all the opportunities for growth and I also think the doctors are amazing at what they do. Why did you decide to become a dental assistant? When I was 6 months pregnant with my daughter 15 years ago, I chipped my front tooth, and I thought it was the end. I had never had any serious dental work, and I was mortified. I thought that I would have to get a fake tooth and would cost me a lot of money. When I went to the dentist, they did a bonding, which I had never heard of, and before I knew it, I had a tooth that looked exactly like what I had before and even matched the color! I was so impressed and amazed that after I gave birth, I enrolled in a dental assistant program and have been assisting ever since. 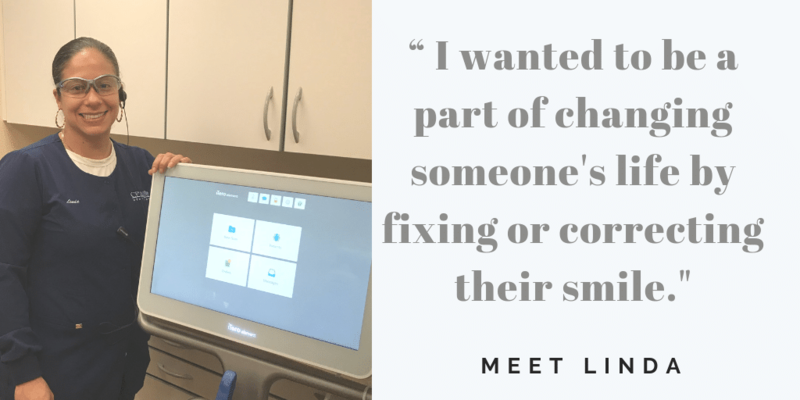 I wanted to be a part of changing someone’s life by fixing or correcting their smile, which is the same way I felt after my tooth was repaired. I really enjoy being a dental assistant, and the fact that I work with such an amazing group of people who equally share my passion for this field helps too. I am a single mother, and I need to be able to support my daughter, so that’s also a big motivation. If you had to describe yourself in five words, what would they be? Energetic, passionate, at times a little sassy, funny, and eager to help others. If you could live in a book, TV show or movie, what would it be and why? Definitely the TV show “Heart of Dixie” because it’s about a city girl who inherits her late father’s medical practice in Blue Bell Alabama. The town is so small that everyone knows everyone. The whole town goes to church on Sundays, and every week there is some sort of event that the entire town takes part in. I just think it would be very cool to experience that kind of living.